Can Bergevin balance immediate need with Habs long term goals? 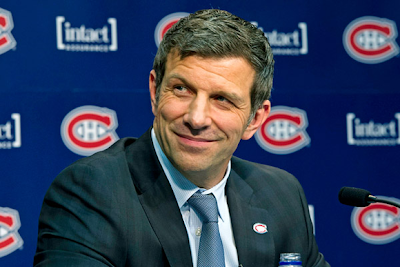 Heading into the April 3rd trade deadline, there are 2 areas of concern for Marc Bergevin to address so we’re about to find out just how focused he is on the long term retooling of the Habs with the playoffs crowding his field of view. With the waiver claim of Jeff Halpern we saw a measured, low risk attempt to improve the 2nd penalty kill unit and if Bourque, Prust and Diaz are out much longer with no NHL-ready offensive help coming from Hamilton, the Habs will need to trade for a top 9 physical, scoring winger and a shooting defenseman who can also handle 2nd unit power play duty. The problem is that from 2008-2011, the Habs traded away 7 top 3 round draft picks so while having 6 picks in the top 90 this summer, including 3 2nd round picks are burning a hole in the pockets of those who want trade(s) for immediate help, I suspect hope Marc Bergevin will move cautiously and protect most of those picks. While Bergevin might target a rental or two, it’s likely he’ll try to pull off a couple cold-filtered hockey trades for players with term/value left on their contracts with prospects and their own 2nd and 3rd picks this summer on the table, keeping the higher round picks from Calgary, Nashville and Dallas for themselves. Failing that, prospects bundled with a 2nd or 3rd in 2014. The Habs currently have $3.68 million in cap space and another $4.25 million stuffed inside Tomas Kaberle’s bloated carcass that could be swapped for an equally bad contract with term to address an immediate need who would replace Kaberle as the Habs 2nd buyout option this summer, if necessary. With the addition of Jeff Halpern and David Desharnais sitting on a cherry 4 year contract, I believe Bergevin is done tinkering at center, at least until the summer, so I won't bother detailing trade options down the middle. As for Ryane Clowe, a pending UFA who turns 31 before next season, hasn't played since March 16 but is supposedly close to returning after re-aggravating a shoulder injury that's bothered him most of the year. From the cheap seats, Clowe has all the markings of someone who'll need off-season surgery so I'm not sure he's worth the risk to pay a high rental price. Brouwer is a physical winger that can play either side. Average speed but provides secondary offense and is capable of playing top 6. Glencross has a No Movement Clause but the two-way winger is fast, physical, drives the net, can work the PK and provides secondary offense. McGinn is a hard working winger that plays a physical, two-way game with hands to pitch in offensively. Korpikoski is a two-way physical winger that can play all 3 forward positions and work the PK while providing secondary offense. Jones is finally healthy and slowly rounding into form. A physical winger that can play either side and pitch in offensively. Needs to work on his defense and discipline. Fehr has average speed but has the size and hands to play in traffic. A solid, two-way winger that can provide secondary offense. Solid puck mover who handle help run a power play. Last two years in Edmonton have been a disappointment but change of scenery and promise of playoffs could do wonders. Can still contribute to the power play and penalty kill. Physical with a strong shot. Doesn't play physical but can help on the power play and penalty kill. Excellent shot and mobile. Solid puck mover that can handle power play and penalty kill minutes. Not physical enough. Solid defensive defenseman that's solid on the penalty kill.